UniFirst air freshener options help eliminate distracting odors to promote a clean, fresh environment. Unpleasant odors in restrooms or offices can be a major distraction for workers and visitors alike. For just pennies a day, UniFirst air freshener services neutralize and scientifically eliminate odors 24/7. Our commercial odor control systems maximize effectiveness and reduce labor and refill costs. And you don’t have to worry about maintenance because we do it all for you. We regularly inspect your dispensers and refill them as needed. All UniFirst commercial air fresheners are EPA compliant, reduce waste, and contain biodegradable or recyclable materials. Take charge of restroom odors with UniFirst commercial air freshener services. View our full line of commercial odor control systems online in the UniFirst Facility Service Programs Catalog. 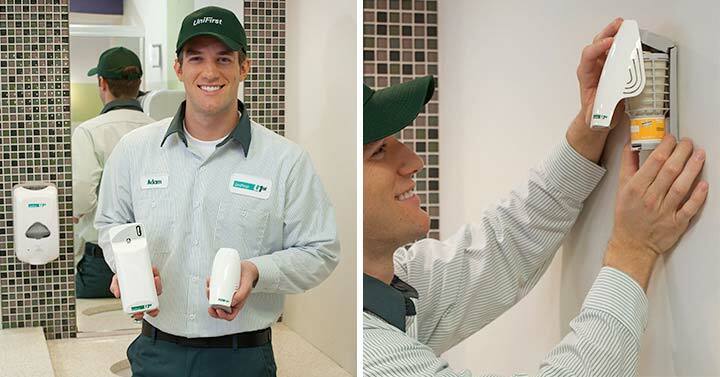 Start UniFirst automatic air freshener services today. Call (800) 455-7654. Browse our online catalog and choose from a wide selection of air fresheners and commercial dispensers. Conveniently customize a commercial odor control service quote for your company.